Chainzonline.com offers custom inside engraving for all the rosary rings we sell. All are crafted from solid 14K gold or solid sterling silver to last a lifetime. Our computerized engraving equipment can scale text, in both block and script, to accommodate most needs. Personalizing your rosary ring with inside engraving is a great way to make a special gift even more special. Rosary rings, or finger rosaries, represent a single decade. Each has a cross in the center and ten raised beads around the outside. They are very comfortable to wear and convenient to use. While reflecting on one of the mysteries of the rosary, start by reciting the Our Father Prayer on the cross. Then rotate the ring to the first of the ten raised beads and recite the Hail Mary prayer. Continue rotating the finger rosary to each of the ten beads and reciting the Hail Mary Prayer. Once you return to the cross, recite the Glory Be prayer. You have now completed a decade of the rosary. Traditionally, praying the full rosary involves fifteen decades. One decade for each of the mysteries of the rosary… 5 Joyful Mysteries, 5 Sorrowful Mysteries, 5 Glorious Mysteries. In 2002 Pope John Paul II announced the addition of the 5 Luminous Mysteries. Some choose to pray all twenty mysteries as a full rosary. Others still pray the traditional fifteen. A standard, or traditional, rosary is 5 decades. While many choose to use a traditional rosary, many prefer the convenience of a single decade rosary ring. Keeping track of the decades prayed is as easy as moving the ring to the next finger as each decade is finished. In addition to rosary rings, ChainzOnline.com offers fashionable single decade rosary bracelets as well as traditional length rosaries in addition to our rosary rings. To our valued customers… We have been receiving mutiple complaints from consumers regarding purchases made through www.livingsocial.com from www.chainzjewellery.com that are not being delivered to the purchaser. ChainzOnline.com does not advertise on Living Social and is not connected to nor affiliated with Living Social or Chainz Jewellery in any way. UPDATE! We continue to receive multiple complaints… daily… from consumers making purchases through www.livingsocial.com from www.chainzjewellery.com that are not being delivered. I am a master jeweler by trade. I have been in the industry for more than 30 years. Our website… ChainzOnline.com has been online for more than 10 years and we take great pride in our products and customer service. ChainzOnline is pleased to announce we now ship our gold and silver religious jewelry to Canada. All shipping is done via FedEx Priority and typically arrives in 1-3 days. 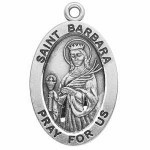 With the recent miraculous evens in Chile, where 33 miners were rescued after having survived 69 days trapped underground in the San Jose Mine, it’s hard to reflect a bit on the patron saint of miners, St. Barbara. It was truly inspiring to watch, as one by one, the trapped miners were hoisted to the surface. Saint Barbara’s feast day is celebrated on December 4th. She lived during the 3rd century and in addition to being the patroness of miners, architects, artillerymen, and builders pray for her intercession. It was her imprisonment by her father in a tower that led to her being associated with builders and the military. When she was beheaded by her father, it is told that a bolt of lightning from the heavens struck him down. Thus, the association with firefighters and sudden disasters like mine collapses and why she is invoked for protection against such. Why is the Mezuzah Important in Judaism? The mezuzah is a small, decorative wall hanging that includes within it a prayer scroll. Most people know this and can recognize one, but why is the mezuzah so important in Judaism? The scroll within the mezuzah has the words of the Shema, or the Shema Yisrael on it, which is one of the more important prayers in the Jewish faith. The prayer talks about always remembering the words of God and honoring them at all times. It’s a prayer of recognition that God is the one and only God, and that you are devoted towards recognizing that and following him. In addition, the mezuzah also represents a very important event during the exodus from Egypt of the Jewish people. The Jews were instructed by God to paint a streak of lamb’s blood down the front of the door frame. The lamb’s blood would be a sign to God to protect the inhabitants inside. Specifically, the lamb’s blood would protect the first born child, who would otherwise be slaughtered as a result of the final plague that God cast upon the Egyptian people. The occasion is remembered during the Jewish holiday of Passover, recalling that the Jewish homes were passed over by the angels of death. A mezuzah is hung on the doorframes of Jewish homes to protect the inhabitants and to honor God at all times. Many homes only hang a mezuzah on the front door of the house, while many other Jewish families hang a mezuzah on every doorframe within the house. The exterior of the mezuzah features the Hebrew letter Shin, which is the first letter of God’s unspoken name. The mezuzah is hung at an angle on the door frame and there are very specific guidelines for creating them properly. As explained above, the mezuzah always contains the passage of the Torah known as the Shema. This is a very important prayer which basically symbolizes one’s devotion and reverence to God. By hanging the mezuzah on the doorframes of your home, you are always reminded of God’s presence and of his words. In fact, each time you enter or exit a room you are supposed to touch the mezuzah and then kiss your fingertips as a sign of this respect and devotion. By wearing a mezuzah pendant you are taking that a step further by always keeping God with you. 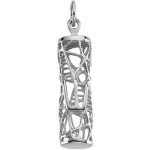 A mezuzah pendant allows you to constantly show the world your belief in the one true God, and your devotion to him. In times when you may need guidance or instruction, you can touch the mezuzah pendant to try to find answers or peace of mind. If you ever want to make a prayer to God but don’t know the right words, you can turn to the mezuzah, symbolizing the Shema and your respect and acknowledgement of God. Mezuzahs don’t have to be restricted to the doorframes of your home. Bring one with you all the time with a mezuzah pendant to continually showcase your love and devotion to God. The mezuzah is a hugely important symbol of the Jewish faith, and keeping one with you is a fantastic way to keep everything it symbolizes with you at all times. Jerusalem is one of the holiest cities on the planet. The city has been in existence for well over 5,000 years and has been the focus of both religious devotion and intense and violent conflict centered on religious ideals. Jerusalem is not only an important city for Judaism, but it is also an important city in the Christian and Muslim faiths. This multifaceted importance is the main reason why the city has been constantly fought over throughout history. The Dome of the Rock and the Al-Aqsa Mosque comprise the Noble Sanctuary and is the third most important location in the world for Islam. Among other important properties, the Islamic faith records that it is here where Muhammad journeyed and then ascended towards heaven. In Christianity, the same location is believed to be where Jesus was crucified, buried and then resurrected. Today, the Church of the Holy Sepulchre resides in this location. The importance of Jerusalem as the Holy Land for Judaism extends back even farther, to at least the 10th century B.C.E. That’s over 3,000 years that Judaism has laid claim to Jerusalem as being its holiest location, an extraordinarily long period of time and a full 1,000 years before Christianity’s emergence. The history of the Jewish people in the region now known as Israel, formerly known as Canaan, extends far beyond that as well. Jerusalem was the location of the first Temple, built in the 10th century BCE which was subsequently destroyed several hundred years later by the Babylonians. The Temple was the holiest prayer location for the Jewish faith and its sole place of sacrifice. The Temple was rebuilt as the Second Temple, which would also eventually be destroyed, this time by the Romans in the year 70. The Jewish faith also believes that one day the Third and final Temple will be built in this same location. Today what remains of the Temple is the Western Wall, also known as the Wailing Wall. It is not a wall of the Temple itself, but rather is a wall from the large Temple platform or Temple Mount on which the Temple was built. It is a location of extreme importance to the Jewish faith, and pilgrimages are made there to not only mourn the destruction of the Temples but also to connect with God in general and to mourn for anything else. The Temples were constructed in this location in Jerusalem because it is supposed to be the most holy location in the Jewish faith, making Jerusalem and the surrounding country the true Holy Land. It is believed that in this location the world actually began, it is where it was essentially built from scratch and where God created Adam. Additionally, it is believed that this specific location is where God chose to permanently keep his name and presence, known as the Shekhinah. It can be hard to believe that the three major monotheistic religions on the planet all lay claim to the exact same location as being one of the most important, or the most important, to their religious lore. However, when one considers that all three stem from the same tree of Judaism, perhaps the picture becomes a bit clearer. Still, with conflict over who has the right to the land still going on today, the Holy Land is a place of extreme turmoil as it has been for thousands of years. 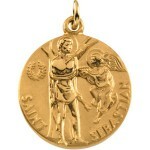 St. Christopher medals are extremely popular in the world of sports. One must wonder why so many athletes and teams wear medals of the saint and pay their homage to him. Perhaps it is because St. Christopher is the patron saint of travelers. There are few things closer to the heart of the athlete then finding a way to win on the road. A visiting team in sports faces many kinds of challenges. They have to play on the other team’s turf and in front of the other team’s fans. In many instances they have to travel a long distance and be kept from their families back home. All of this adds up to the home field advantage, and it can be hard for even experienced and dedicated athletes to overcome. That’s why teams work so hard on winning their home games, because they know they have the advantage and there shouldn’t be any excuses for a loss. Winning a game on the road therefore is no easy challenge. That’s where St. Christopher comes in. Throughout the world St. Christopher medals and medallions are placed on vehicles and are worn by travelers to ensure safe passage. An athlete or a team in the midst of a road trip or in need of some help winning a game on the road can certainly use the assistance of the patron saint of travelers. It’s a fact that many sports teams and many athletes consistently perform at a higher level on the road than other teams and other athletes. Not everyone seems to be able to naturally make up for the home team advantage however. Having St. Christopher on your side is another way an athlete can try to give himself or herself an edge. Athletics are as much about mental strength as they are about physical strength or skill, and in many instances mental focus and commitment are even more important than any physical attributes. 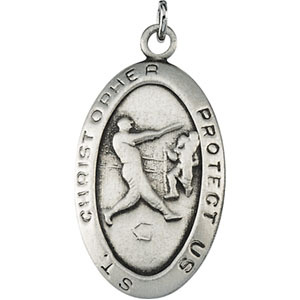 Simply knowing you have the protection of St. Christopher can help give you and your team more confidence in your abilities to play well on the road. If you spend hours on the practice field and in the gym training your body, then why shouldn’t you also spend time fortifying your mind? Take advantage of the patron saint of travelers to give yourself a mental edge and a spiritual strength that can translate to on the field success. Even when you’re playing at home, St. Christopher still comes in handy. After all, you don’t wish for any harm on your visiting opponents, and you want them to play to their fullest capability. There’s no fun or sense of accomplishment in beating an opponent that didn’t try hard or play well. As an athlete, true accomplishment comes when you beat the best at their best, when you are challenged with adversity and still find a way to succeed. Saints show up in the sports world in many different ways. From the St. Louis Cardinals to the New Orleans Saints, the presence of saints and religion go hand in hand with sports. Having the assistance and guidance of St. Christopher is just another one of the ways that athletes and teams can try to succeed and work on completing their goals, of playing well, winning and emerging unscathed. Well… given the upcoming presidential election and the recent $700B bailout out bill I thought it might be a nice idea to remind politicians, government officials we elect, of who their patron saint is… St Thomas More. 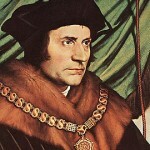 In the event you didn’t already know, Sir Thomas More was indeed a politician. Born in London in 1478 and studied law at Oxford and became Lord Chancellor of England. He’s also the patron saint of lawyers. Tried and convicted of treason (politicians take note of this) he was beheaded on July 6, 1535. I really don’t expect many politicians, lawyers or other government officials to be reading this nor do I wish to push any religious beliefs in your direction. But especially during these troubled times a bit of divine intervention, a little patronly direction for doing what’s right, (whether or not you believe in such a thing) wouldn’t be such a bad thing would it? Pray that, for the glory of God and in the pursuit of His justice, I may be trustworthy with confidences, keen in study, accurate in analysis, correct in conclusion, able in argument, loyal to clients, honest with all, courteous to adversaries, ever attentive to conscience. Sit with me at my desk and listen with me to my clients’ tales. Read with me in my library and stand always beside me so that today I shall not, to win a point, lose my soul. I often receive emails and comments from soldiers and their families. Each one of them is most often very touching and heartfelt. A while back, the mother of 2 sons serving in the military purchased a St. George medal for each of them shortly before they were deployed to Iraq. 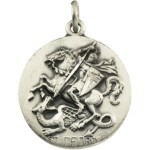 Saint George is the very popular patron saint of soldiers. She wrote that they were all she had in the world and hoped that the medals would help to guide and protect them and bring them home safely as she did not know what she’d do without them. I want to thank each and every member of our service men and women for bravely and proudly serving our country. I want to thank all of your families for what you do and they endure for your service. I’m not an overtly religious man but do have my beliefs. I pray because I choose to. One prayer I particularly like is A Prayer For You. I added the prayer to ChainzOnline and read it often. Each time I read it, it’s just as touching as the first. The two names that are listed there are the names of the two sons for whom the medals were purchased. According to his legend, Sebastian was born in Gaul and became a soldier in the Roman army. When it was discovered that St Sebastian was a Christian, during the rule of Emperor Diocletian, it was ordered that he be bound to a stake and shot by archers. Left there for dead or to die, it was St Irene who returned to the spot to bury St Sebastian only to find him still alive. Irene tended to Sebastian nursing him back to health. Once this was discovered, St Sebastian was beat to death with a club. His martyrdom, about the only thing that can be proved, was in 288. The reason Sebastian is the patron saint of athletes was partly due to his physical endurance. He is also the patron saint of archers and all soldiers. A Basilica is said to be built over his remains and was rebuilt in 1611. An arrow said to have struck St. Sebastian and the column to which he was reportedly bound, is housed in the Relics Chapel. Saint Sebastian’s feast day is celebrated January 20th.